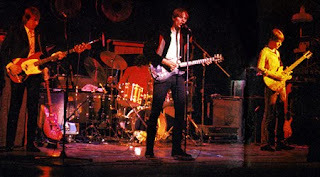 This is Television live at The Bottom Line Club in New York back on the 29th July 1978. This concert has been circulated as 'The First Farewell' and 'This Case Is Closed' both suggesting and confirming the historical nature of this gig, as it was indeed the final live concert of Television until 1992. At the time it was of course unknown if the band would perform or record again. The source of this recording is from the linage that led to 'This Case Is Closed' which suffers a little in the early stage from level adjustments, but is compensated by perhaps one of the best live recordings of the classic song Marquee Moon ever captured. Sound Quality: Very Good (some audio level adjustments noticeable on second track), mp3@320kbps. Genre: Punk Rock, New Wave. The original bootleg version was circulated on Colosseum Records, No. 97-C-016, released 1997. Download link in comments below or click on the picture. Thank you, I don't know Television and I will start with this concert !